Learn Proven Strategies to Perform with Confidence in Games! If you’re ready to improve your mental toughness and perform with stable self-confidence in games, we have a program that is right for you. Fear of failure and worry about outcomes. Inability to take practice confidence into games. Fragile confidence after bad serves or mistakes. Poor emotional control or ability to cope with mistakes. Inability to play freely and relaxed in games. Digital Download ONLY – Get immediate access to the program. No shipping costs! Avoid costly international shipping charges! Having helped our personal coaching students overcome these challenges, you too can discover the top mental game strategies we have taught to club, academy, high school, and college volleyball players! We’ve helped thousands of elite athletes including top youth, collegiate, and pro athletes from many sports for nearly two decades. Dr. Patrick Cohn is president of Peak Performance Sports. He is an author, professional speaker, and the nation’s leading sports psychology expert. His mental coaching programs instill confidence, composure, and mindsets that enable athletes and teams to reach peak performance. Dr. Cohn has helped amateur and professional athletes and teams from a variety of sports develop mindsets needed to reach peak performance. Dr. Cohn has written a number of sports psychology books, including the popular Confident Athlete CD series, and runs the world’s most comprehensive online mental training system. Dr. Megan Melchiorre was a participant in numerous sports including collegiate volleyball at Peace College in Raleigh, NC. She has also coached club and high school volleyball. She works with high school, college, and professional athletes to improve their confidence, focus, and other mental game challenges that block success. In addition, Dr. Megan has a Bachelor’s Degree in Child Development, a Master’s Degree in Sports Psychology and a Doctorate in Clinical Psychology from California Southern University. Tiffany Creamer plays Beach Volleyball at Georgia State University while majoring in Psychology. She previously played Division I volleyball at Stetson University in Deland, Florida where she ranked 8th in school history with 42 dual match victories, posted a 20-10 overall record and a perfect 10-0 record in ASUN play. She also qualified for the Swedish National coed beach championship, won the Chicago Beach Slap tournament coed division and took first in the NCSVA Women’s Open tournament. We’re on a mission to teach you proven and simple mental game strategies so you can overcome any mental barrier, take your practice game to competition, and boost your confidence in volleyball. We won’t waste your time with psychobabble or research! Just simple, proven mental game strategies to help you perform at your peak! The best part is that you too, can tap into our expertise and experience in coaching athletes to improve their mental game. 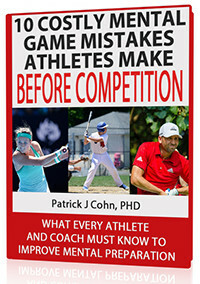 I’ve worked with athletes for 25 plus years – and know the top challenges that hurt athletes’ performance in competition. You’ll learn the top eight mental game lessons for volleyball players – the same lessons we teach our personal coaching students, who pay thousands of dollars for our strategies. We’ve made sure that our lessons are easy and effortless for you to improve your mental game. Who Should Purchase “The Mental Edge For Volleyball”? “The Mental Edge For Volleyball: 8 Mental Strategies For Peak Performance” Audio and Workbook program is ideal for any club, academy, college, or professional volleyball players. In addition, volleyball coaches, instructors, and parents would also be wise to teach the strategies we provide in “The Mental Edge For Volleyball” to their players. What’s Included In “The Mental Edge For Volleyball” Program? “The Mental Edge For Volleyball” is a complete brain dump of the TOP eight mental training sessions we teach our volleyball players to help them boost their mental game and improve consistency – from how to mentally prepare for games to performing under pressure to building unstoppable confidence. Eight “Mental Edge For Volleyball” confidence-boosting sessions on audio. Each 25-30 minute session includes one mental training lesson to help you improve confidence, focus, composure, and develop focused routines. Three “Mental Edge For Volleyball” bonus programs for setting smart goals and coping with pregame jitters. Download 3 Bonuses With Your Order! You’ll learn how to focus your mind and trust your skills using an pre-serve routine, as well how to mentally prepare to perform well during serve receive. (bonus value = $50.00). You’ll learn the difference between normal, pre-game jitters and performance anxiety. You’ll also learn how to embrace pregame jitters as helpful to your performance. (bonus value = $50.00). You’ll learn how to set smart goals for volleyball to help you improve your performance and strive for success. (bonus value = $20.00). Total VALUE of Bonus Package: $120.00! What’s the Cost of “The Mental Edge For Volleyball”? “The Mental Edge For Volleyball” Audio and Workbook program is the most comprehensive mental game program we’ve offered to the public. We’re virtually giving away all our mental game secrets for the incredibly low price of only $197.00 including the free bonuses! This is our way of saying “thanks” to our loyal Peaksports subscribers! Of course, we’re happy if you instead choose to enroll in our one-on-one mental coaching program! However, our one-on-one personal coaching program starts at $500 for one month of coaching! 1. The easiest and most efficient way is to place your order online today. Click Here to Order Now. 2. Call us toll free 888-742-7225 and place your order with a valid credit card. Have your email, address, phone number, and credit card handy. We stand by our work 100%… we never want you to feel like buying “The Mental Edge For Volleyball” Audio and Workbook program is a gamble. Embrace my strategies and apply it 100% to your game. If you’re not happy, for ANY reason in the next 30 days, just contact us by email or phone, return the audio and workbook and we will buy it back. You’ll get a courteous refund of every penny! Does that sound fair? Thank you for taking the time to read about “The Mental Edge For Volleyball” Audio and Workbook Program – the best value to rocket your confidence, focus, and composure to new heights. Please contact us if you have any questions!